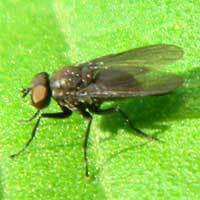 Many fly species alight in the sushine in order to regulate body temperature. 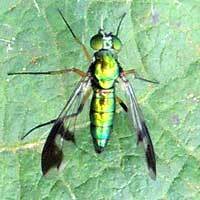 The Oriental Latrine Fly is a marvelously irridescent fly of jade and gold. The larva, or maggot, developes within corpses or carrion. Such is the economy of Nature. This one is deep cobalt blue. The larva, or maggot, lives in garbage or carrion, maybe of a different condition or type. Such is the variety in Nature. 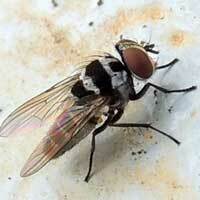 These flies visit flowers or alight on leaves, but never gather at garbage or around kitchens. Many species large and small, but most with bristles. Thorax with longitudinal striping. Red eyes. 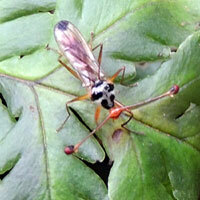 Small diptera warming itself in the sunshine. Name and biology a mystery. Three dark gray spots on each wing might be a unique trait. Red eyes. 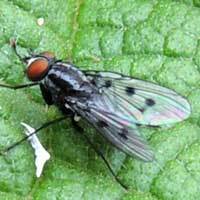 Relatively small horse fly with black, patent leather look. Females bite and take blood. 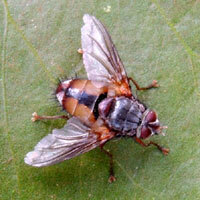 Several, not so closely related flies have this same bold pattern. 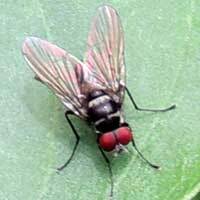 This brightly marked, red-eyed fly was alighted on vegetation in a garden. Eldoret. Four examples of Anthomyiidae of perhaps four different species? 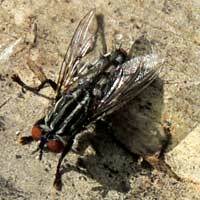 Yet another fly with v. large eyes and with a black and white pattern on prothorax. My guess (SWAG) is that this shoot gall growth is the result of feeding larvae of a Cecidomyiidae, a mosquito-like fly. 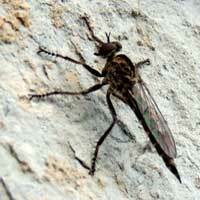 Robber flies are partial to alighting on exposed, smooth rock surfaces as well as man-made concrete. 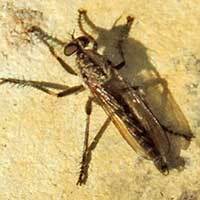 Active, predatory flies that often alight on rocks or logs in the sunshine. 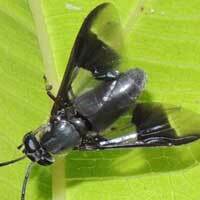 Catches other flying insects, raptor-like. This robber has captured a long-legged nematoceran fly. Notice the very large eyes. 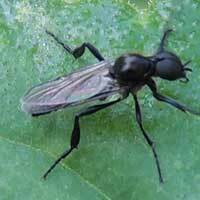 Males are showy with their strutting behavior on sunny leaves. 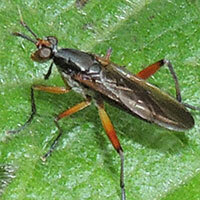 Only about 8mm long. Eyes and antennae on the stalks! 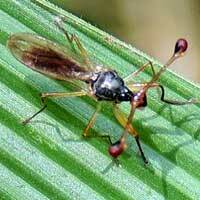 Bizzare-looking fly with its eyes spaced wide apart on long stalks. 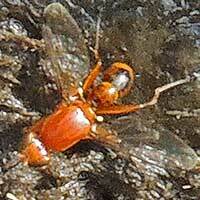 This one has black and white markings on the pronotum and the head is red. The immature stage of this fly, a worm-like larva, is a predator of snails. Adults sit on sunny vegetation. 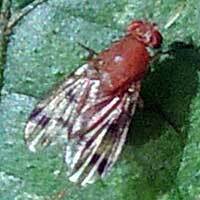 Males of adult fruit flies display on a leaf or other surface. 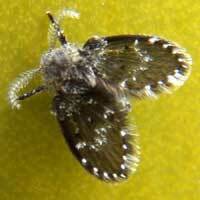 This one has unmarked wings. Wingspan 5 mm. 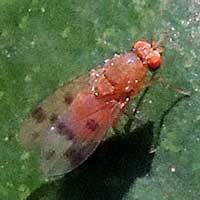 Male fruit flies like this one often dance around on an exposed surface to attract a mate. Wings are marked with dark bands. Similar to #2. 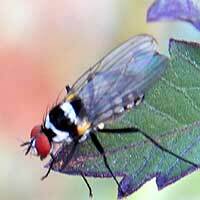 Many species of wild fruits among the forest trees and shrubs means many kinds of fruit flies. 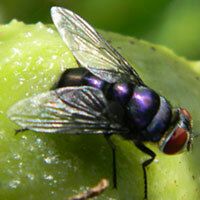 Many species of fruit fly can be found visiting dung. This one has no wing markings. 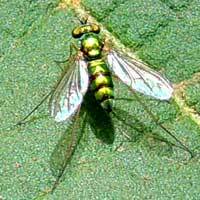 Most Dolichopodidae are iridescent blue or green and have long, slender legs. 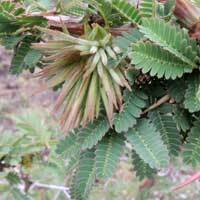 Often seen on leaves in the sunshine. 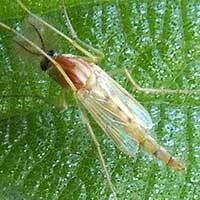 Dolichopodidae move about fast on long, slender legs. 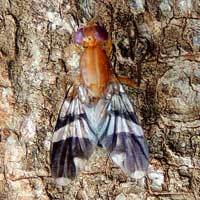 This species has marked wings. Less than 5 mm long. 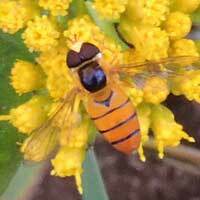 Hover Flies, like bees, visit flowers, and presumably can be agents of pollination. 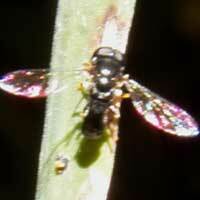 Flies that strongly resemble bees and often visit flowers. 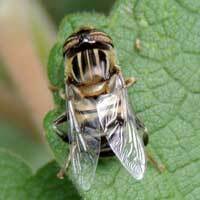 Many species classified as Syrphidae. This one has stripes on thorax dorsum. 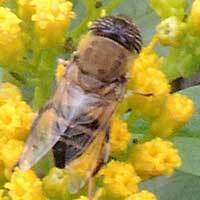 Adult hover flies are frequent visitors at blooming plants where they take nectar. 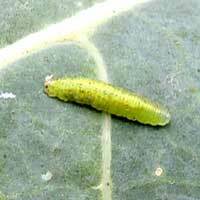 Legless and slug-like larva lives on plant surfaces where aphids are present. Captures and feeds on aphids. 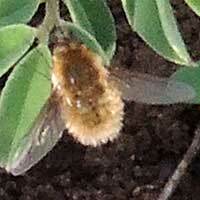 Bee Flies do not sting and have one pair of wings instead of two. 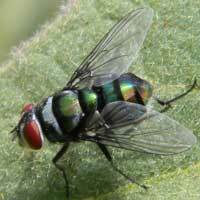 Often they hover above and then alight on bare soil. 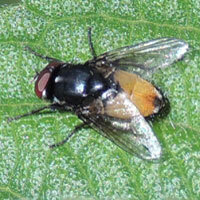 This little fly, about 3mm, has some peculiar morphology that might clue a dipterist. The eyes are very large, filling the dorsum of the head. Enlarged pronotum. 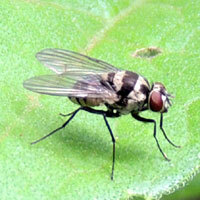 Observed at Kitale. 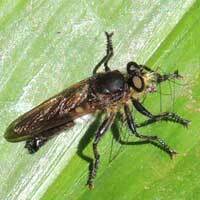 These small flies look like tiny moths with feathery wings held flat when sitting. White spotting. Usually near wastewater drainage. When traveling in much of Africa it is wise to use bed nets and repellants against mosquitoes which are vectors for a variety of serious diseases. 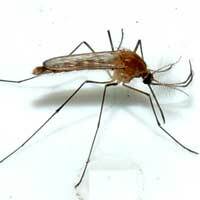 Delicate flying insect resembles a mosquito. 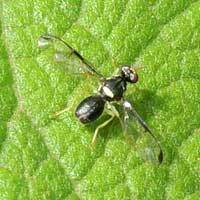 Immatures are often known as blood­worms. 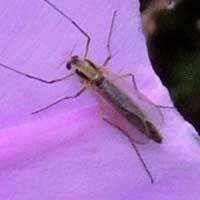 Chironomid flies look like mosquitoes but do not bite and have wings w/o markings. Adults emerge from water and generally do not feed. 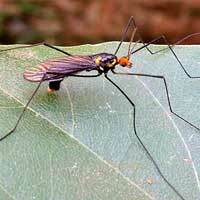 Crane flies are so named for their extraordinarily long, slender legs. 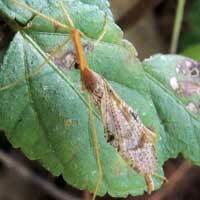 Crane fly with peculiar perching behavior that makes it look like a dried leaf fragment. Disclaimer: By no means am I an expert on the Natural History of Kenya. I am a novice exploring this part of the World. By creating a page for the species as I encounter them I am teaching myself. If I make errors I hope that a kind person with expertise will let me know so that I can make corrections.